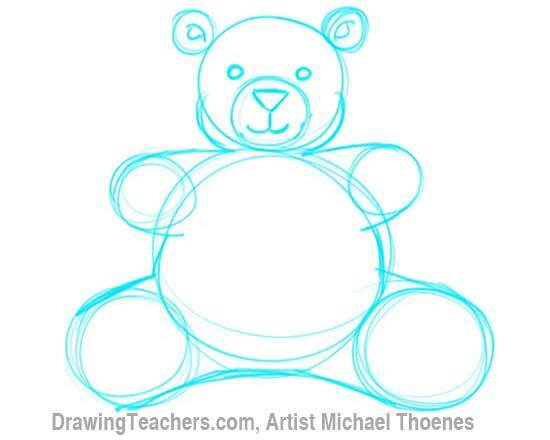 Wondering How to Start your Teddy Bear drawing? 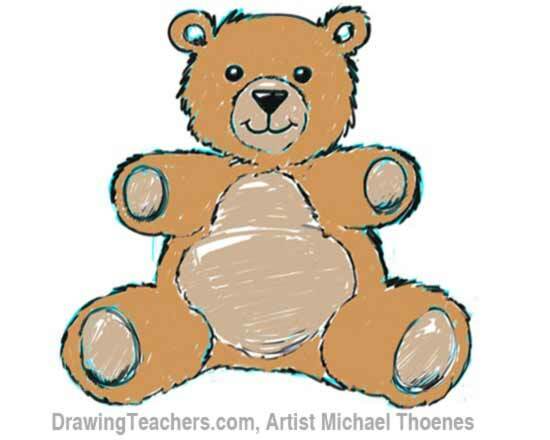 A teddy bear is a great stuffed animal toy to draw. Almost everybody likes teddy bears. I remember my first. I named him" Teddy." Well, that was not very original, but I was only 5 years old. My bear was made by the Steif company in Germany. He came from Germany in fact as a gift from my grandmother. I imagine today he would be collectible if I had not played with him so much that his straw insides started to poke out and his hands and belly wore thin. He lost so much fur on his belly and back from going down the slide in my back yard that my mommy had to make a little coat for Teddy. He still hangs around the house today and reminds me of what it was like to be a little kid. 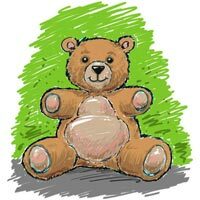 Teddy Bears make great art for birthday cards, get well soon cards, even Christmas cards, You can really change the style of your teddy bear drawing by giving him or her a hat like a stocking cap for Christmas, a party hat for birthdays and so on. Moms with new babies seem to like teddy bear pictures a lot. Actually I think just about any parent likes a teddy bear drawing, especially If a message like "I love You Mommy", or "Your Great Dad" accompanies the drawing! Bear toys have been popular for a long time, but it wasn't until U.S. President Theodore Roosevelt that stuffed bears were called teddy bears. The legend goes that Teddy Roosevelt's, niece had a stuffed bear and said, "I looks just like my uncle Teddy." Perhaps she wanted to know how to draw a teddy bear too. 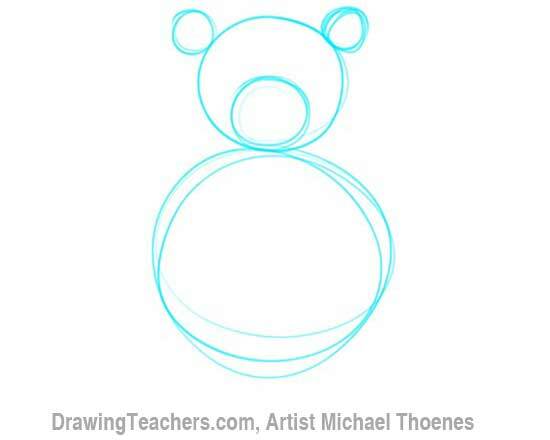 Follow the steps below and you will be drawing teddy bears good enough for a President! 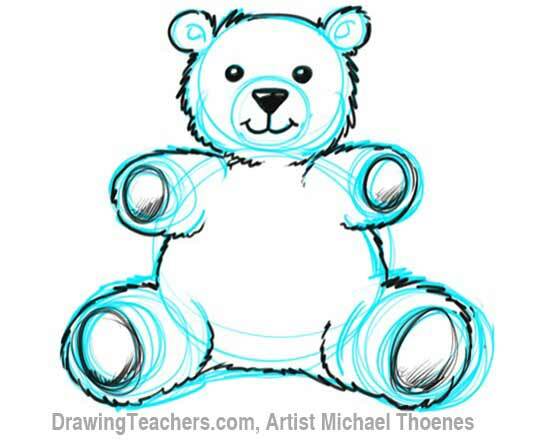 Now let's get started with "How to Draw a Teddy Bear." 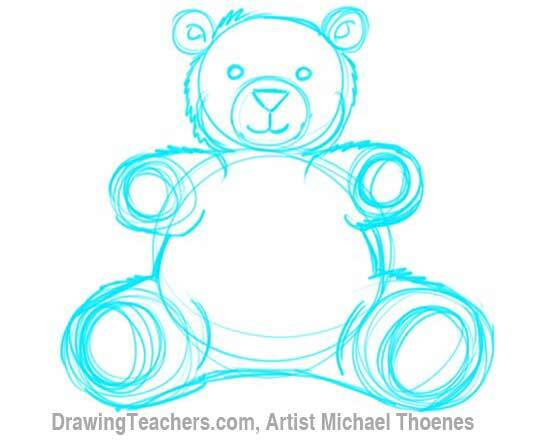 Begin your teddy bear drawing with a circle for the head and a circle for the body stacked one on top of the other. Now it is time for the arms and legs, add circles for those as well. 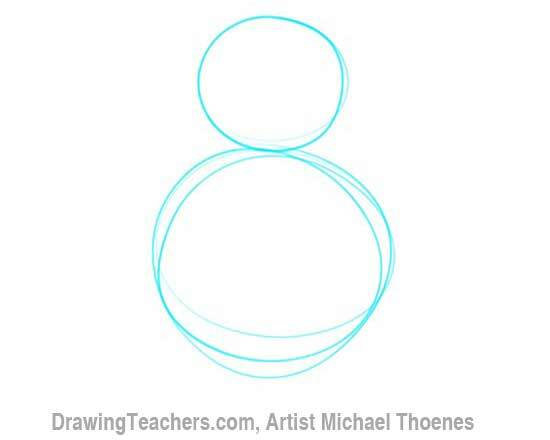 Connect the arm and leg circles to the body with lines as shown below. To make your bear look furry add wavy lines around the edges of your bear. Use a pen or marker too ink the edges of your bear. This is a good time to make any corrections or adjustments. 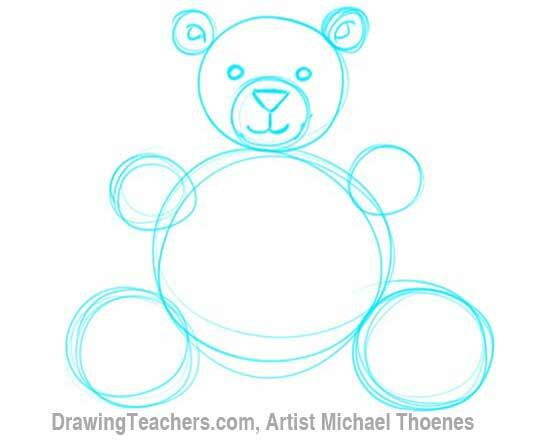 Complete the teddy bears snout and draw curved lines to outline his belly. Give your bear a base color. 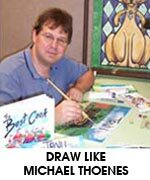 You can use crayon, colored pencil,. marker or paint. Your technique may vary depending on what you use. Shade the parts of the bear that would receive less light when lit from above. This would be the underside of the arms and the lower edge of the face and belly. This shading gives your teddy bear 3-dimensional form. Add a pink tone inside the ears and on the pads of the hands and feet. Add a fun background for a bear. 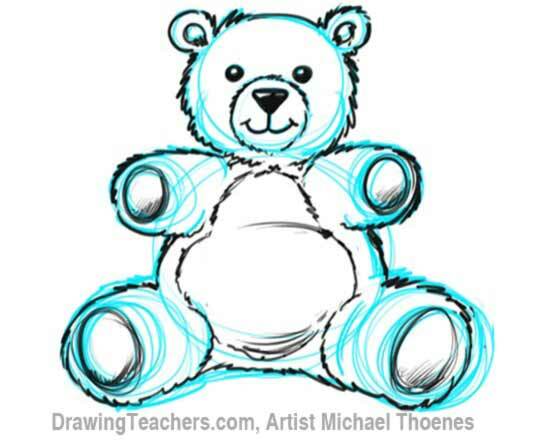 Here is a Similar Teddy bear drawing Video Lesson I recently made. You can follow along and draw a bear. "How to Draw a Teddy Bear!"